One of the most common questions I get from readers of the Theory Forum, or from private students, is “How do I know when a chord progression changes keys?” While there are a number of ways to recognize key changes in a song, one of the easiest, if it’s present, is to find the Pivot Chord. Pivot Chords also provide a powerful tool for writing songs with key changes. In this lesson, you’ll learn what a Pivot Chord is, study common progressions that use Pivot Chords, as well as practice finding different Pivot Chords with some self-study progression at the end of the lesson. So, let’s dig in and discover the wonderful world of Pivot Chords! Intro - What is a Chord Progression? To begin, let's take a look at what exactly is a chord progression, where those chords come from and why they are written in both letters and Roman Numerals. If you are familiar with this bit of music theory, take a quick glance to make sure you understand this section of the lesson and then feel free to jump down to the next section to dive right into Pivot Chord Theory. Most chord progressions are built by taking the notes of any given key, C major for example, and harmonizing those notes by adding 2 or more notes on top of those scale notes. An example of this would be the chords in the key of C major, which you get by adding 2 notes on top of each note in the scale that are a two scale notes higher each time. So, if you take the first note C, then skip a note you get E, and skip one more note you get G, when played together these three notes, C-E-G, form a C chord, the tonic chord in the key of C major. If you repeat this process over every note in the C major scale you get the following sequence of chords. These are the chords that you can use to write a song in the key of C major. To make things easier to communicate between musicians, and to allow you to transpose quickly any chord progression you know, we also talk about chords in a key like this in Roman Numerals. Here is how those same chords would be written out as Roman Numerals. I usually add in the dim for the vii chord to indicate that it's different from the other minor chords, as upper case Numerals, I IV and V, are used to indicate major chords, and lower case Numerals, ii, iii and vi are used to indicate minor chords. As you can see, the chords C, F and G make up one of the most common chord progressions in modern music, the I, IV V progression. Can you find any other famous progressions in these chords? Here you can see an example of both major and minor key chords written as letters, such as C and Dm, as well as Roman Numerals, such as I and ii. Getting to know the chords in major and minor keys both as letters and Roman Numerals will help you understand how your favorite songs are written and organized, as well as allow you to quickly grab a chord in the right key when writing or jamming along to a chord progression. Now that you've had a brief intro, or refresher, on chord progressions and how they come about, let's check out what happens when you have a chord progression, or song, that moves between two different keys. When this happens you will need to have a chord that connects both of these keys, and this is what we call the Pivot Chord. 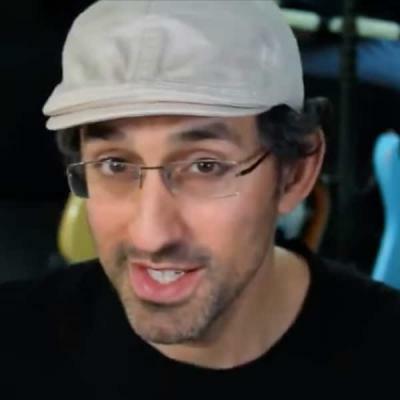 ➥ To learn more about how to build and harmonize major scales, as well as learn how to play and build common chord progressions, please check out my "How to Build Major Scales", "What Are Triads", and "Classic Chord Progressions for Guitar" lessons. What is a Pivot Chord? To begin, let’s look at what exactly is a pivot chord and see one in action as you modulate keys from C to F in a common progression. A Pivot Chord is one that is found in two related keys, so the chord C in C major and F major for example. In C, this chord is the tonic, I, chord. While in F, this chord is the Dominant, V chord. Because it occurs in both keys, C and F, you can use the chord C to smoothly modulate from one key to the next. You can see the two key side-by-side in this chart, with the pivot chords labelled in red. Notice that the C is the I chord in C major, and the V chord in F major, which is where the pivot occurs in the following progression. Here is an example to check out that it does just that. Notice in bar 3 that the C chord is functioning as both the I chord in C, and at the same time the V chord in F. This is a Pivot Chord as the next chord, C7, is the V7 of F and you are now firmly in the new key centre. As well, the same chord, C, is used in bar 8 to bring the progression back to the key of C major, marking another Pivot Chord moment in this 8-bar chord progression. As you can see, and hear when you play through these chords, the Pivot Chords allow you to move between the keys of C and F without any hitches or hiccups; both instances have a smooth transition between keys. Here are a few examples of common chord progressions that use pivot chords. As you have already seen movement between the I and IV keys, the first example will start off with movement between the I and V keys, C and G in this progression. Here is a chart to help you visualize the two keys, as well as the G chord which is acting as the pivot chord in this progression. Notice how the G, the V in C, is also the I in G, and so it acts as a Pivot Chord in both bars 4 and 8. Try playing this progression on your guitar to hear how it sounds, as well as see it on paper when studying this Pivot Chord movement in the practice room. The next Pivot Chord progression moves between the I key, C in this case, and the relative minor key, A minor, using the chord Dm to Pivot between these two key centres. Dm is both the ii chord in C, as well as the iv chord in A minor, and therefore it is a natural choice to act as a Pivot Chord between these two key centres. You will notice that Harmonic Minor is being used for this, and all minor keys, during the lesson. The reason that we use this scale for minor sounds is that it contains the V and V7 chords, as opposed to a v minor chord from Aeolian (Natural Minor). Moving from one key to the next often involves solidifying that movement with a V7 or V chord of some sort, V to I or V to i is a very strong motion in music. This is why Harmonic Minor is preferred to Natural Minor due to the availability of the V chord which helps us solidify the movement from one key to the next. If you want to learn more about this scale, check out my Harmonic Minor for Guitar lesson on this forum. Here is a handy chart for you to check out that will help you see the two keys, C and Am, side by side, as well as the pivot Dm chord which is written in red in both keys. Try playing through this progression to hear how this pivot sounds when moving from tonic major to it’s relative minor, which is a common key movement in just about all styles of modern music. Though not as common as moving to the IV, V or vi keys, you can use Pivot Chords to move to other key centres such as II major, as in the example below. In this case, the iii of C major, Em, is used to pivot to the key of D major, as it’s the ii chord in that new key. Again, here is a chart that lays out the two keys, C and D major, as well as highlights the pivot chord, Em, in red so you can visualize both keys and the pivot Em chord before taking them to the fretboard. Try playing through this progression to hear how it sounds. It’s not as commonly used as the other examples you studied earlier, but when you’re writing a song, or working out a progression and you want to go somewhere unexpected, a good Pivot Chord can help make that unexpected transition smooth to the listener’s ears. 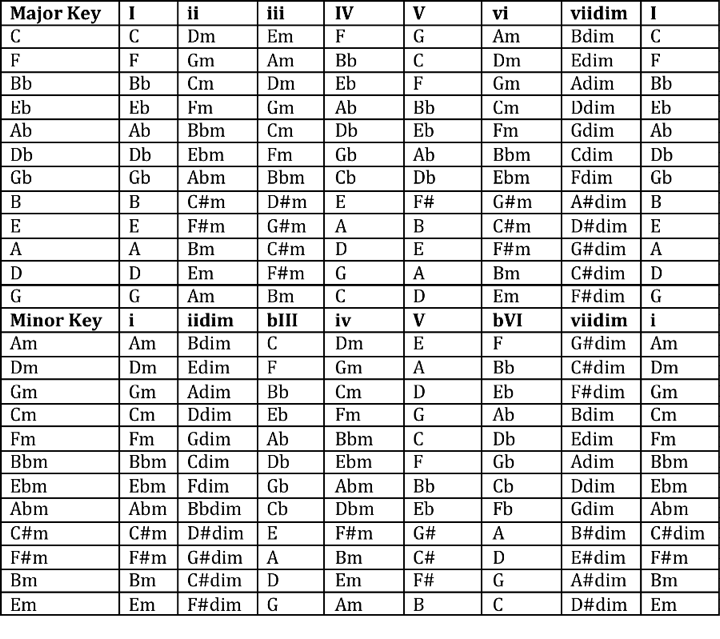 To help you visualize all of the 12 major keys, and see which chords you can use to move between them, here is a master chart that lays out each key, all of the chords in that key, and their letter and Roman Numeral designations so that you can easily compare them between themselves. To help you get started with applying Pivot Chords to your song writing vocabulary, here are a few tips to keep in mind the next time you want to switch keys in the middle of a chord progression, or between larger sections in a song as a whole. 1. The tonic chord is often used to modulate to the IV key. 2. The V chord is often used to modulate to the V key. 3. The I chord can also be used to modulate to the V key. 4. The ii chord is commonly used to modulate to the vi key, the relative minor. 5. The iii chord is used to modulate to the II key. 6. Playing I to I7 is a great way to move to the IV key. Do you have a Pivot Chord tip or favourite modulation chord that you want to add to this list? Post it in the comments section below and we’ll keep the list growing over time. To help you further your study of Pivot Chords, here are three different progressions that you can analyse and find the Pivot Chord and key change in each progression. The answers are in the spoiler buttons on top of each progression, so try it out first and if you get stuck you can post a question below, or you can check the answers above each example. For each progression, try and find the pivot chord(s), as well as indicate the two keys, Key 1 and Key 2, in each phrase. Good luck! Here are three more chords progressions for you to test your Pivot Chord knowledge with. In these progressions, there are two blank bars in each 8 bar phrase where you need to fill in the missing Pivot Chords. Good luck and if you have any questions, or want to post your answers, you can do so in the thread below. The first chord progression starts in C and moves to the key of F. Can you add in the Pivot Chords in bars 4 and 8? The next chord progression starts in C and moves to Am, can you add in the Pivot Chords to bars 4 and 8? The final chord progression starts in C and moves to G. Can you add in the the Pivot Chords to bars 4 and 8? C or G in both instances. Do you have a question or comment about this lesson on Pivot Chords? Thanks for the lesson Professor! I was writing a song recently which incorporates key change and this lesson will be very useful to those who are looking for tips and theory behind changing keys within a song. Thanks guys, glad you dug it! Wow, this is absolutely fantastic, loads of information here, I'm gonna go through it all, I was actually thinking about this like since 3 days ago Thanks a lot! Cool man, hope you find the info helpful! Great topic, and a nice breakdown of the fundamentals of pivot chords! Glad you dug it, have fun with this stuff! cool take your time with it and have fun! Hi, I am confused by the bIII C chord in the Am (harmonic) key. The G# would surely give the C a raised 5th hence not really making it a C major? Hope you can clear this up for me? Thanks! Yes this is correct, The third chord in A harmonic minor should be C Aug (C-E-G#). I assume this is a typo, I'll see if we can get a comment from Matt. Welcome to the forum btw Ramsay! Not quite. It may seem funny, but when building chords we only use the G# in Am for the V and vii chords because it is the leading tone. It is more common to use C rather than Caug in that case. So you get a C chord, then E and G#dim. It's a bit strange at first, but it's because the V and vii lead to the tonic chord, and bIII is used in other ways. Hope that helps. Ok interesting, so we basically mix natural and harmonic minor when constructing those chords. Thanks, I learned something new! Thanks guys, I'll 'try' to remember this! Lovin' the content on this site. Great job!